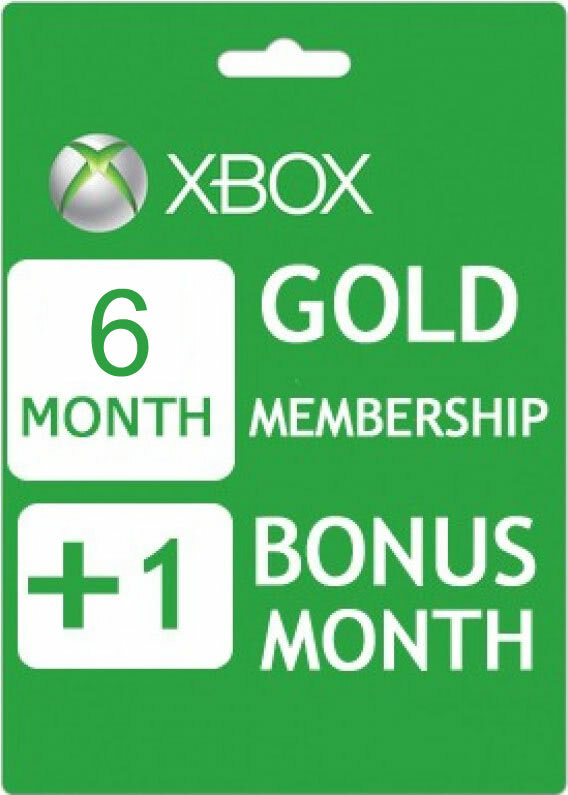 This is a 6+1 Months (210 days) Xbox Live Gold Subscription Card redeemable on US/EU/RU accounts. Get the most from your Xbox One and Xbox 360. Experience unrivaled multiplayer gaming, premier entertainment apps, Internet Explorer and exclusive member benefits. Only with Xbox Live Gold: Play together with friends to build imaginative, awe-inspiring worlds. Compete in heart-pounding matches that require quick thinking and fast reflexes. Whether you are in the mood for cooperative or competitive gameplay, Xbox Live has something for everyone. With the world’s premier gaming community, there is always someone ready to play matching your skill and style. Play in more places: Enjoy the freedom to play your favorite games in more places than ever. Easily access your games, friends, and community across Xbox One, Windows 10 PC, tablet, and phone. Wherever you go, your games and achievements go with you. And when you stream your Xbox One games to your Windows 10 PC, you can continue to play with your friends and record your best game moments. Share epic moments and bring awareness to your accomplishments: Earn Achievements and add to your Gamerscore across Xbox One, Windows 10 PC, tablet, and phone. Take screenshots and capture your best gaming moments with build-in Game DVR. Use the footage to create amazing videos, add commentary, and share them with your friends. You can also broadcast gameplay live from your Xbox One via Twitch for the world to see. Create your own identity as a gamer. Customize your Gamertag, create your own Xbox Avatar, and bring together everything that matters to you in your Gamer Profile. Battle-tested performance: Powered by hundreds of thousands of servers, Xbox Live delivers maximum performance while reducing lag and cheating. With over 1 billion multiplayer matches played each month, Xbox Live is built for performance, speed and reliability. Get massive discounts and exclusive offers for new and classic Xbox One and Xbox 360 games with Xbox Live Gold subscription! Each week, Xbox Live Gold members can save up to 50-75% in the Xbox Store with exclusive discounts on select games and add-ons. Get FREE Xbox 360 and Xbox One games twice a month. You will always have something to play on your favorite consoles! After adding them to your library, you will be able to download and play any of these games at any time for the duration of your Xbox Live Gold subscription. Enjoy Xbox Live Parties - a robust chat system, exclusive to Gold members: Xbox Live Parties are built to help you stay connected and more easily play games with your friends. Quickly group up, voice chat, and move smoothly in and out of games together. Or choose to keep the conversation going while members of your party play different games, now even between Xbox One and Windows 10 PCs. If you have an account on Xbox Live simply log in to your account on www.xbox.com/redeemcode, and enter the 25-digit code. If you need to get an account - Go to live.xbox.com and follow the steps to create a new account. Then go to www.xbox.com/redeemcode, and enter the 25-digit code.